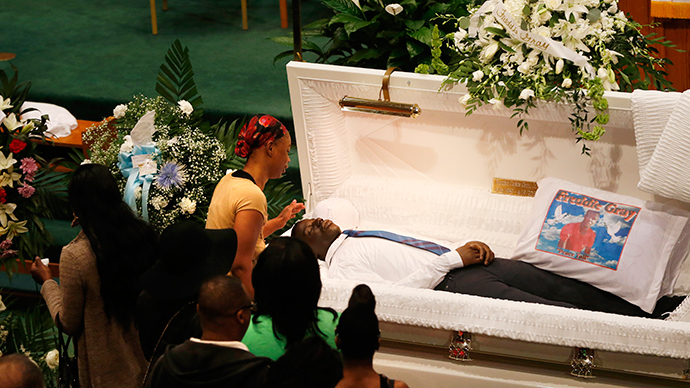 Thousands of mourners gathered at a church in Baltimore, Maryland, to attend the funeral proceedings for Freddie Gray, the 25-year-old black man who died last Sunday from injuries sustained a week earlier while in police custody. Services for Gray began Monday morning at New Shiloh Baptist Church, with thousands expected to attend, including officials from the White House and relatives of Eric Garner, the African-American man who died last August in the custody of the New York Police Department. The walls of New Shiloh on Monday were illuminated with the words “Black Lives Matter” and “All Lives Matter” during Monday’s service as attendees lined up to pay their respects while a choir of more than 40 sang gospel tunes. “After this day, we are going to keep on marching. After this day, we are going to keep on demanding justice. After this day, we are going to keep exposing our culture of corruption,” Bryant continued. Many of the more than 3,000 attendees had never met Gray. Rep. Elijah Cummings (D-Maryland) was one of several elected officials who attended Gray’s funeral. Patricia Wudel, 62, who was among the few white mourners at the church, drove to the service from her home in Washington, DC, she told the Washington Post as she clutched a dozen red roses in her hand. Erica Garner, 24, the daughter of Eric Garner, who died in New York police custody, attended Gray's funeral, AP reported. She said she came after seeing video of Gray's arrest, which she said reminded her of her father's shouts that he could not breathe when he was being arrested on a city street. "It's like there is no accountability, no justice," she said afterwards. "It's like we're back in the `50s, back in the Martin Luther King days. When is our day to be free going to come?" Gray will be buried nearby later in the day. On April 12, Gray was apprehended by members of the Baltimore Police Department after fleeing on foot from a cluster of officers. He suffered a severe injury to his spinal cord while in the custody of the BPD and died a week later. Six police officers remain suspended pending the results of an internal investigation into the affair. Protests erupted across Baltimore after Gray’s arrest and intensified following his death. Mayor Stephanie Rawlings-Blake and the family of Freddie Gray have urged protesters to remain peaceful, but police reportedly arrested dozens over the weekend when rallies turned violent.